henry1: MG not trusting Conan much because "it seems he is different from the boy (they met) ten years ago." Black Demon: Page 15: Conan: "Asaka the bodyguard... a woman..."
Black Demon: "If [she is] the number 2 member of BO, Rum... then what Haibara said about being 'feminine' refers to 'ooks girly on the outside but is strong like a man on the inside'"? 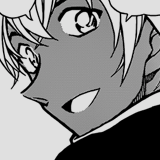 Black Demon: "If [she] already had been a bodyguard 17 years ago... then her age must be pretty high..."
Black Demon: "If she'd also taken the same poison as I did and reverted back into the age of a middle-school student... then the suspicious one is... the one whom Sera called ‘mother’..."
Black Demon: "This woman... Who on earth is she?" Black Demon: Also, according to Sera, the culprit said that someone saw Asaka holding "that small mirror with a handle". Nope i don't think so. Remember what elena said to shiho that the drug is "dream drug" so the actual purpose isn't some poison drug and what pisco said to haibara which could be interpreted as the project not complete. So... How come the regular member got the incomplete version of drug to kill someone? and if we add the boss character as the careful one i think that not possible. But it will possible if in the first place the BO project is to make some killer weapon with undetected death then someday the haibara's parent and another scientist encountered the side effect of the drug. Then Haibara's parent with their co. decided to research the side effect of the drug without BO knowing. After that The Big Boss without knowing anything use that drug to kill his/her enemy. So you think Mary is Rum? 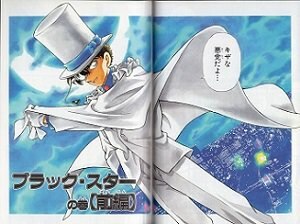 You believe Shinichi/Conan thinking this isn't another one of Gosho's red herrings? however I still think the Urusei Yatsura stuff has to mean something, even if there aren't any grounds for it to mean something in the series so far. Sera: "Mind if I lend you a hand? You're in a tight spot, aren't you?" Conan: "N-not at all! I'm not in a tight spot!" Sera: "But what about Kogoro - san? He does look like it, doesn't he?" Sera: "Oi, oi! Answer me! He really looks like he's sleeping!" Conan: "Wha... Wait a min..."
MG: "Sleep is...A physiological state with a periodic loss of consciousness that is constantly happening again and again..."
MG: "In short. It's almost impossible for a human to talk during sleep..."
Conan (thinking): "A smartphone...behind the neck? Where's the voice coming from?" MG uses odd wording and a bossy manner of speech: Takagi and Megure point that out but MG pays no heed. MG: "Are you an idiot or what...? Try to imagine it: there's no way that the "something" stuck in the window frame will be pulled away in such a neat manner with wind alone!" Sera: "But... Wouldn't someone stumble upon that cloth once it's hit the ground?" MG: "Masumi... I guess you didn't see it but..."
"W-who are you? Outta the way!" "I-is he dead? No... He got a gritical spot hit with precision and his consciousness got reaped... In the mere seconds it took for me to reach this room... With a quick move similar to that (employed) by (a/the) Secret Service... There's no doubt... This is (her) handiwork... That (sister) outside the domain's..."
Sera: "Ah! No... Are you OK, Conan - kun?" Conan (thinking): "Did she say... Mom?" Sera: "Man! It was to be expected from you, mom!" MG: "So? What was that info that Hatto had gotten his hand into?" Sera: "Furuki said it before being taken away in the car but... It'd seem that Hatto figured out that someone saw that bodyguard, Asaka, who's missing, holding a hand mirror... And that Asaka was a woman... He intended to call for Haneda Kouji's spirit and yell "A woman! A woman's gonna kill me!". MG: "So that was it. Worthless." MG then orders Sera to pack up because they're going to change their stronghold. Sera argues that it was a piece of luck that Conan got to know they were on this hotel. 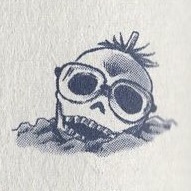 MG: "It's like connecting with a demon in the darkness... Don't lower the guard when it comes to Edogawa Conan... Because he feels like he's someone else instead of that boy (we) met 10 years ago..."
Conan (thinking): "That Asaka was a bodyguard and a woman... If Asaka's the BO's number 2 RUM then... 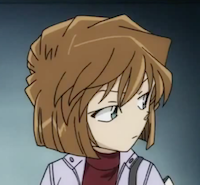 When Haibara said "an effeminate man" did she mean "it's a woman but on the inside she's as strong as a man"? If (Asaka) was a bodyguard 17 years ago then they must be pretty old... The first suspect that comes to mind is that girl whom Sera called "Mom"... If if turns out that she was de-aged to middle schooler age by that same drug that de-aged me... This woman... Who is she really?" Vodka: "Oh. Looks like the guy's dead... Hatto Gaito, the guy who was digging for info about Haneda Kouji's case..."
Gin: "That asides... What's picking me is that Sleeping Kogoro... It'd seem that the guy was involved to some extent in this morning's case, wasn't the guy?" 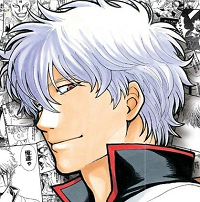 Gin: "It's like connecting with a demon in the darkness... If the guy's the demon then we gotta kill it while it sleeps..."
I know right? I mean, now we know where Shu got his badassness from. You mean the "tied to the demonic darkness" part... or her just straight up calling Wataru an idiot? 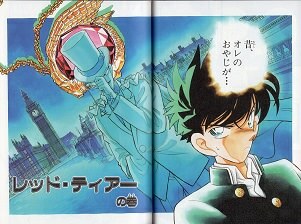 So Gosho has them use the same line to further the Mary = Rum red herring... as expected. Even with so little interaction, Mary has picked up on the fact that wherever Shinichi/Conan goes, someone gets murdered, and being tied to someone like that makes her uneasy. Wonder what she saw in seven-year-old Shinichi that she thinks has changed, in him, especially if they met during a case. 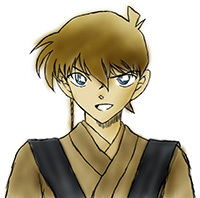 With all the "Conan is a death god" stuff, I wonder when Gosho's going to pull out something like "he doesn't attract death, or murderous/malevolent/vile intent, but, rather it attracts him," and if someone saying something like that will get her to stop being wary of him. Was this translated from the Japanese? if so, what was the specific Japanese phrasing of the mirror conversation? Black Demon: Note about the mirror: In the Japanese file, the word used by Sera is [あの]手鏡 (te kagami) - "that hand-mirror". The same Kanji was used in past files to refer to Kohji's "Put on Mascara" mirror, so Sera is most likely talking about the same thing. I agree, it can be the same mirror, because a hand mirror can be a mirror that has a handle, or a mirror that can be carried with a hand, like the put on Mascara mirror, its small and easy to carry around. Ah, I just figured out what that mirror is for! It's the reason Hotta Gaito thought Rum was female. The mirror is an accidental feminine prop like in Sato's Omiai case in the Vermouth arc, there was a male suspect who wore his watch on the inside of his wrist and misled someone into thinking he was a woman that way. If you saw someone ambiguous holding a cute little hand mirror, your brain would go to girl. I think I have Gosho's plan figured out now. We are going to have 3 Rum cases. Rum Case #1 is stars girly Rum. Next case we run into with Rum, maybe another flashback, a witness is going to come out and have a completely different idea, like he's a geezer. Then case 3, strong dude. I can see how hand (hando) and handle (handoru) might have been confusing to rapid translators, just one letter difference if was spelled out in foreign sounds furigana. If it is the same mirror, that raises even more questions than two separate mirrors. We already know the case is weird because Kohji managed to have the time to turn on a sink, grab scissors, and then cut a mirror to leave a dying message (not to mention how he overheard some conversation about Asaka and Rum). If Kohji was in a similar situation to the victim from the latest cut glass case, then he must have known death was coming, so I guess he was cornered and knew it. The new issues that arise is how Asaka got that mirror after someone else went to Kohji's room and had time to look over and photograph the crime scene. It could have been Asaka's mirror to begin with (so he was seen with it before the crime), but Haibara seemed to think is was Haneda's, keeping in mind that Elena nee Sera had one of those mirrors also and that the Hanedas and Seras seem to be close. I assume Asaka took the mirror in order to hide the dying message, and he was seen with it fleeing. For the photos to exist and Kohji to leave a message, Asaka must have lost control of the situation somehow. Was he distracted, or people forced their way in, or he was forced away from the scene? All I can think of is that this may be the situation that cost Rum his eye (assuming he is Asaka). Kohji inflicted the wound in desperation and bought himself some time to leave a message. The specific word used for "demon" in that quote/saying is "oni"
for reference Lum-chan is an oni.